It is a beautiful crisp fall morning at Disney. I can’t wait to visit the parks and let you know what is going on here this week. After arriving at the Ticket and Transportation Center, I head for the Ferry Boat, my favorite way to cross to the Magic Kingdom. As I climb to the second level I immediately see to my left that construction on the Disney Vacation Club Villas at the Polynesian has begun in a very visible area. Check out the photo below and you will see what I saw. It is pretty hard to tell from this beginning what the new structures will look like. DVC just celebrated opening their 12th resort: the Villas at Disney’s Grand Floridian. It has a full view of the Magic Kingdom and is on the monorail route. Mickey and Minnie were on hand of course to cut the ribbon and welcome folks to their home away from home. They are gorgeous and have an amazing view! There is always a wonderful breeze aboard the ferry and looking across the lake to see Cinderella Castle coming ever closer is such fun. I see the people on the other ferry boat as they wave and share smiles with the people on my boat. As we approach the landing at the Magic Kingdom, just to the right you will see there is a lot of concrete that has been poured today in the future bus stations that makes it look so much closer to completion. So, did you hear? Magician Mickey Mouse surprised guests by talking with them! 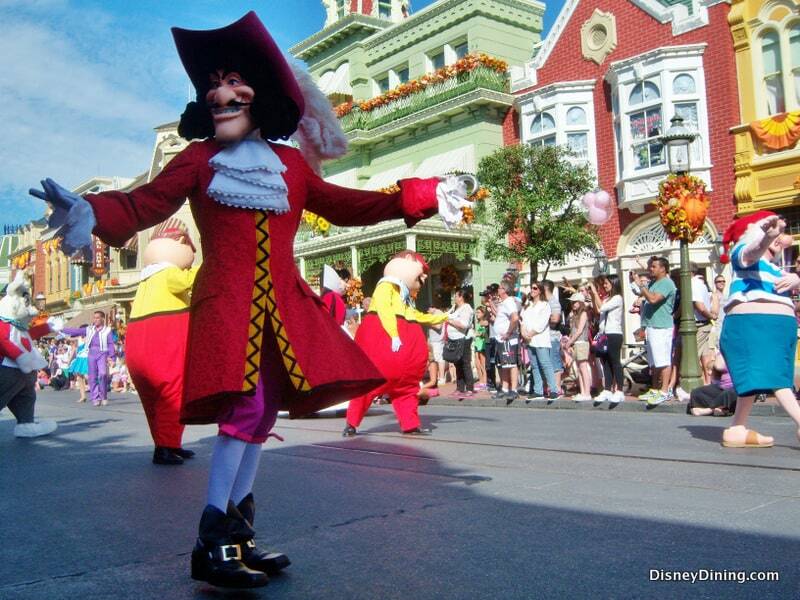 Yep, Mickey will greet you with his voice, and he may even teach you a magic trick! This is not a Limited Time Magic event. I can see by the line heading into the Town Square Theater that guests are very excited to visit their favorite mouse and share a greeting with him. It is good to know that there is a Fast Pass for this, especially if the stand-by line is hours long. Speaking of hearing…I just heard the Walt Disney World Railroad come into the Main Street Station. It is good to hear that familiar sound. The train recently was down for refurbishment of the track. I can look across Town Square and see that the line at the Firehouse for the Sorcerers’ of the Magic Kingdom game is fairly long. Remember, you now have to play a portion of the game, if you are already registered as a player, prior to getting your new set of free cards. Another bit of news for those who like to play this game when they come to the Magic Kingdom: as you know the game is played on three levels. The highest level was recently upgraded to a more difficult stage as you challenge the villain. Disney confirms this change of the highest level, but as I chat with some players, they tell me they see a difference in the medium-level play as well. I am drawn down Main Street enjoying the more comfortable Florida temperatures and the fall decorations. I want to take you back to New Fantasyland to see what is going on back there. There is actually work being done in regular Fantasyland still: Peter Pan is still closed for refurbishment, as is the outside eating area of Pinocchio Village House. I am pleased to see the new “mountain”, the 7 Dwarfs Mine Train have yellow construction hats all over it. There are more workmen on this site than I have seen before. You can see the excitement of visitors who stand back from the wall to see what is going on, or peek through the tiny windows that Disney placed for the curious to take a look through. People of all ages are looking forward to riding this attraction. We still only know it will be opened in 2014, no other information has been released regarding soft openings or testing yet. I board the Walt Disney World Railroad at the Fantasyland Station and ride it around to the Fronteirland Station. Nice ride! The line for Splash Mountain is over an hour long, even with the cooler temperatures. But it is such a great ride, so of course I want to ride. I get a FastPass for 4PM, two+ hours later. Big Thunder Mountain also has a long line. This is typical of this part of the day as visitors have had time to work their way to the back of the park. Let’s go check out Adventureland! I think I will take up that last treasure map at Pirates Adventure that I haven’t played. This is an interactive treasure hunt game, pirate style, which is free to play. I have played several of the maps already, each map providing a different part of the game. So I follow along from each station to the next. Players need to follow the clues to find the stations and then do what they are instructed to at each station. I see people of all ages enjoying this adventure; why not give it a try the next time you come? It is between the Pirates of the Caribbean attraction and Fronteirland. I was warmed up from the Florida afternoon sun and all that running around on my Pirate Adventure, so I was happy to duck in the shade of the line for Pirates of the Caribbean. Yes, I will ride this every time I come to the Magic Kingdom, if I have any say about it. I keep hoping that maybe this time I can ride through it without it being ruined by visitors who insist on taking flash pictures—despite being told no flash photography while they are in the boat, before the ship leaves the dock. I had to chuckle because on this time through there was a Cast Member hidden in one of the scenes, possibly because the boats were backing up, who loudly said “No flash photography” which stopped the camera holders, but only for that scene. Please, do not take flash pictures on Disney’s dark rides. Jungle Cruise has reopened after its refurbishment and take a look at the photo to see how long the FastPass line was for it today. They have some exciting news at this attraction. For the first time ever, Jungle Cruise will become Jingle Jungle Cruise just for the Holidays, beginning early November. Their special transformation will include decorations, new names for the boats, and special Holiday themed jokes for the boat captains! I have enough time to check out the Make a Dream Parade which is scheduled for 3PM daily, but is going to be coming to an end early next year. I have heard opposing views from avid parade-watchers that if you take a seat in the front, such as on the curb on Main Street, you “should” stay seated so that others behind you can see. The other side says if they took the time to get that spot very early, than they can stand if they want to. In the interest of seeing if the idea of staying seated really mattered, I took photos of the parade from sitting on the curb on Main Street. Honestly, some shots may be ok, but to get really good ones, I believe requires standing up. Check out the photos of the parade below and tell me what you think. Notice how tight the balloon Cast Member is holding onto the balloon strings? It was pretty windy at parade time. Back to Splash Mountain with my FastPass I board and enjoy my favorite Magic Kingdom ride. I want to ride it as much as I can before it closes for major refurbishment on January 2, 2014 until sometime in March. This is a great ride and it is a shame that people miss it because they don’t want to get a little water on them. The Cast Members are great here, the theming is great, and you get a story and a thrill ride! Don’t miss experiencing this attraction because of a little water. It’s Florida; you will dry very quickly here. Have fun! At the special ticket Holiday parties Disney has issued special Sorcerers of the Magic Kingdom card that is only available at the parties. They have announced the card for the Mickey’s Very Merry Christmas Party: Donald Duck’s famous nephews who attack the villains with a snowball fight. When playing SotMK at the party, guests must register to play with their party ticket and event wristband in order to get the bonus special event card. Vera Bradley had launched her special Disney line recently, and the bags were only available in the Disney World Parks but now they are also available at the Disney online store. They will not be available at other Vera Bradley stores or the Vera Bradley online store. They will be added to Disneyland soon as well as a brand new design and colors to be introduced Oct. 29. The Palms Golf Course will be opening a month later than expected, now opening mid-way through December due to excessive rain this past month. I am a huge Disney fan, but I am getting tired of keeping up with their newest solutions to parking at Downtown Disney. Just one month ago, on September 20, Darcy Clark, Marketing Manager, Downtown Disney at WDW, was quoted as saying”Yes, more parking is coming! The best part: parking will continue to be complimentary.” Yet on the very same Disney Parks Blog that I quote from here -now tells of the existing parking being changed to Valet parking for $15. Per vehicle, gratuity not included, from 4PM to 2AM daily. This is supposed to make it easier for our Holiday shopping. Valet parking will take over the WestSide lot, next to Cirque du Soleil. All other parking is behind this attraction or across the street at the SunTrust Bank, or Disney Casting parking lots. I don’t think carrying multiple packages and holding onto kids hands, maybe also pushing a stroller across that busy street sounds good in any way. Many people are not going to want to pay for even more Disney parking, just for the privilege of shopping at Disney stores. Tables in Wonderland members will have receive complimentary valet parking with a valid dining receipt. Annual Passholders will have to pay the additional fee. If you do choose to use the Valet service, drive in Entrance 4 toward Cirque du Soleil, and you will see the stand. When you want to retrieve your vehicle, you wait in line to give the attendant your ticket, or you will be given a code to text in to retrieve your car more quickly. You will need to walk to the Marketplace area on the other end of the complex, or take a boat to the other end. Just remember, you will have to make that same trek or ride back to the West Side, along with your packages and tired family, to retrieve your vehicle.